For students, summertime is often associated with summer vacation, but many adult learners also choose to spend this time working on their degree path. College students take summer classes for a variety of reasons: Maybe you need a prerequisite before starting a program in the fall, perhaps you didn’t pass a course taken the previous spring, or maybe you just want to check some required courses off your list. If you’re looking to complete courses this summer while still leaving some time for summer fun, consider selecting a course that can be done in a quicker time frame. 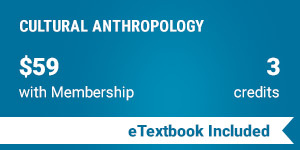 This course provides a solid introduction for students who are new to the branch of cultural anthropology. Topics include anthropological theories, ethnocentrism and culture, language and communication, economic and political systems, kinship and descent, race and ethnicity, globalization, and others. This course is commonly taken for humanities and/or social science general education credits. This course focuses on the US prior to 1861. Students learn about European exploration and colonization of the New World and examine the impact on Europe, Africa, and the young United States. The emergence of political, religious, economic, and social institutions is discussed. Specific causes of the American Revolution are examined, as is the resulting impact on politics, the economy, and society up to the Civil War. A popular course for students planning to pursue a nursing or other health science degree, this course introduces elements of medical terminology, including the etymology of terms. Student learn to identify and explain the terms used for the integumentary, respiratory, nervous, reproductive, endocrine, urinary, digestive, lymphatic, hematic, immune, and musculoskeletal systems. Students also define and describe the function of each system of the body. This course provides students with a comprehensive overview of cultural religious phenomena in a global world. Commonalities and differences among religious traditions and contexts are analyzed, and various religious traditions and points of view are compared and contrasted. Philosophical formulations, sacred writings, religious experiences, ethics, rituals, and art are also discussed. This is a popular course for students needing humanities credits. This course is a critical introduction to the field of philosophical inquiry. It examines the history of Western thought, from the famous Greek philosophers up to cutting-edge intellectuals of today. Thematic topics include metaphysics, epistemology, free will and determinism, evil and the existence of God, personal identity, ethical values, and political philosophy. The course concludes with an analysis of different perspectives, including Eastern philosophies, and post-colonial thought. We have over 100 partner schools, see if your school is listed! What About Enrolling in English Composition? While some StraighterLine courses are often easier to complete in a shorter amount of time, some courses typically require more time for students to complete--this is often due to elements such as lab reports, presentations, and/or written work that must be evaluated by the highly qualified faculty who work as subject-matter experts in the courses. While this course provides an excellent in-depth approach to various writing genres, it does require students to write a selection of essays including a comprehensive research paper. Due to the amount of writing and qualitative feedback, this course may require some additional time to complete successfully. Similar to ENG101, this course requires students to write a minimum number of essays. In addition, students must read and write about the novel Frankenstein, which can add some time for successful completion. A very popular course, BUS105 requires students to use a professional tone to write a selection of business-style documents, all of which are graded by subject-matter experts. In addition, the science lab courses (Biology, Chemistry, Anatomy & Physiology, Physics) will often require additional time for completing the experiments and having your lab work graded. Our grading policy is that you should expect your written work to be evaluated within a window of 3 - 5 business days, so it’s a great idea for you to work this into your schedule as you plan for these courses. Ready to enroll in summer courses? Get started today!